JERUSALEM—A Chabad-Lubavitch rabbi who was found badly beaten in the central train station in Zhitomir, Ukraine, on Friday was airlifted to Israel by emergency medical transport, and remains in serious but stable condition at the Tel Hashomer Hospital in Ramat Gan. Rabbi Mendel Deitsch was found bleeding and unconscious after being robbed and beaten by what was reported locally as “a group of drunks.” The motive was theft, not anti-Semitism, according to Rabbi Shlomo Wilhelm, director of Chabad-Lubavitch of Zhitomir. After learning of the attack, Wilhelm rushed to the hospital in Zhitomir, and “the best doctors were called in from Kiev,” he said. Deitsch underwent emergency surgery in Zhitomir while the victim’s family in Israel urgently worked with the Israeli government and emergency-services organizations in Jerusalem to arrange the airlift. Deitsch has been active in strengthening Jewish life in the former Soviet Union for many years, and is a central organizer of hospitality and programming at the burial site of Chabad’s founder—Rabbi Schneur Zalman of Liadi, in Haditch, Ukraine, where Deitsch is believed to have spent Rosh Hashanah. The rabbi’s injuries remain life-threatening. 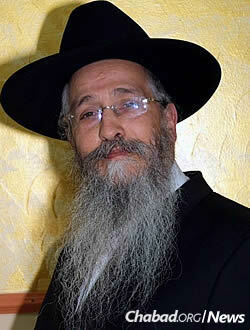 His family asks that people continue to pray for the full recovery of Menachem Mendel Mordechai ben Miriam.